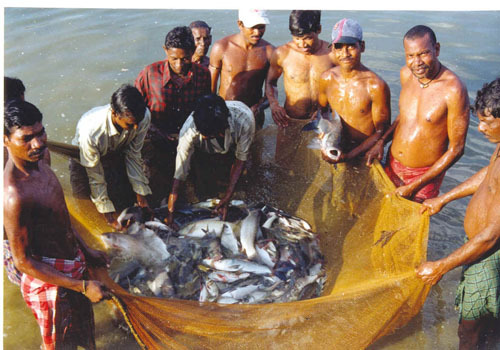 Growth rate of the fish, market demand, desired market size, availability of seed and pond condition, are the major considerations for deciding on the time of harvesting. Usually the carp species attain marketable size within one year and hence the shorter rearing period of less than a year is not recommended unless there is an exceptional threat of flood or outbreak of disease, or for financial reasons. 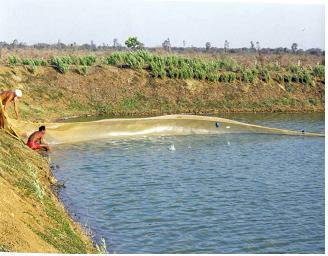 Post-flood stocking and pre-flood harvesting should be done in flood prone ponds while in seasonal ponds harvesting should be done before the water level falls below the critical level. In regions where seeds of desired cultivated species are available only during post-monsoon period, i.e. October/November, the stocking should normally be done during this period and the crop should be harvested by next October. It has been experienced that even under the best management, Indian major carps on an average attain hardly 1 kg in size in a year, while Chinese carps reach over 2 kg or so. This kind of differential growth complicates the final harvesting programme and hence in such areas partial harvesting of marketable size fish is carried out. Further, the market price of fish is directly related to its size. This factor should also be considered before deciding on the harvesting programme. Possibility of partial harvesting very much depends on the availability of fingerlings of desired carp species. In such cases the fish already reached the marketable size should be harvested and the stock should be replenished. Usually fish over 500 g should be harvested every 3–4 months with simultaneous stocking with fingerlings. Such partial harvesting programme should be synchronised with peak market demands depending on seasons, festivals, etc.